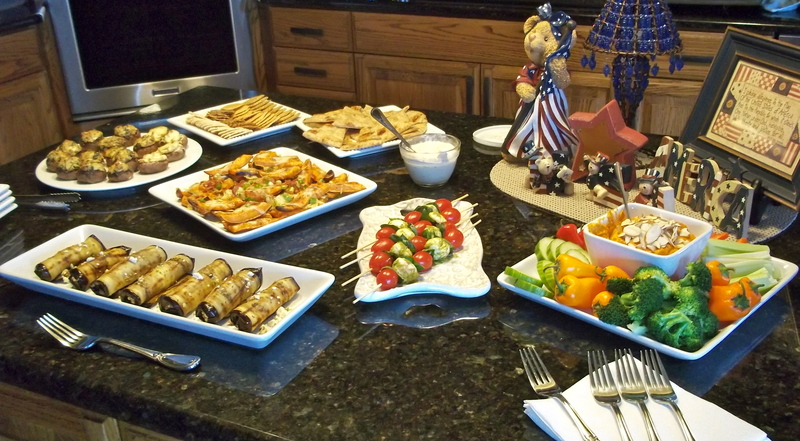 My family loves to get together for cocktails, appetizers and desserts. We enjoy sitting around visiting with each other and having little plates of fabulous finger foods…this always leaves room for a yummy cocktail and a decadent dessert without stuffing ourselves silly with a huge meal in between (we have learned this lesson the hard way)! This appetizer really doesn’t need much explanation. It is super easy, requires no cooking and looks absolutely beautiful on a plate. You can make this recipe as big or as small as you’d like, we generally have 5 or 6 different appetizers so we plan one of these per person, this recipe is for 6 skewers. In a small bowl, toss fresh mozzarella in the pesto and refrigerate for about 30 minutes. Assemble the skewers by alternating the ingredients…start with a tomato, next a pesto marinated mozzarella ball, then a fresh basil leaf. Repeat, ending with a cherry tomato. Trim the ends of the skewers if necessary to fit on your serving dish. 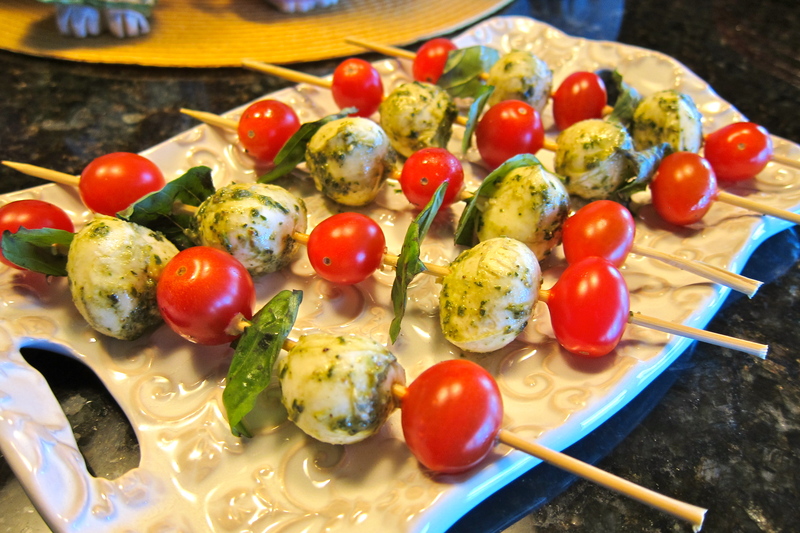 Our latest appetizer get together with the Caprese Skewers as the beautiful centerpiece! What other apps do you serve/what is in the photo? It looks amazing! For that event I did sausage and spinach stuffed mushrooms, roasted red pepper hummus with veggies, grilled eggplant roll ups stuffed with feta cheese and olive tapenade, oh and spicy sweet potato skins. Everything was fabulous! I LOVE how easy and yummy these are! I got it tweeted and pinned! Thanks for linking up at Gluten Free Fridays! You are a favorite this week!